Surely that pair of dirty socks on the floor constitutes a biohazard. 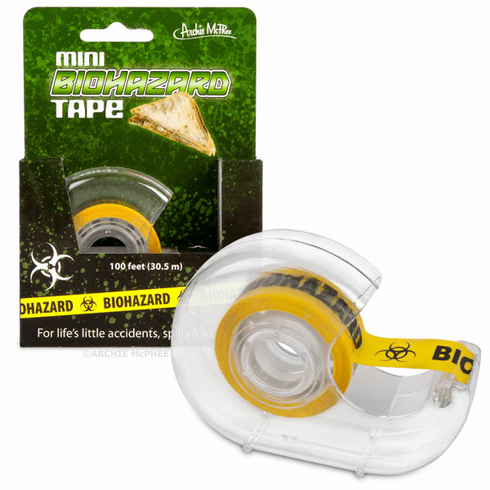 This Mini Biohazard Tape is perfect for letting people know when they've passed the boundaries of good hygiene in a way that might not be bad enough to alert the EPA, but is still pretty gross. Leaving food out on the counter or dirty dishes in the living room is the perfect opportunity to use this tape. Each plastic dispenser has 100 feet (30.5 m) of 3/4" (1.9 cm) wide tape, which should be enough to get the message across to your messy spouse.